PLAY360°, the design philosophy behind ELEMENTS EDGE, is what takes the children to the edge in their search for physical, intellectual and social challenges with friends. Special features like post cleats, post handles, climbing poles, climbing grips, teardrop handles and pipe climbers are placed all around the towers and structures between the different play activities. This gives children an opportunity to go from one activity to the next, switch halfway up, or climb around rather than up. The platforms and 'hangouts' make it possible to take a time-out on the tower tops and have a private talk with some friends in a quiet shelter behind the climbing walls. The modern platform towers and structures make it possible to get an overview of the complete playground and are also a perfect landmark and meeting place. Furthermore, some towers have ground level access and allow kids, regardless of their ability, to go to their individual edge. The mobiles are solitary products adding dynamic play to the towers and structures. The mobiles challenge children's curiosity and make them search for different dynamic games. The mobiles have a small footprint which makes them easy to place in suitable areas of the playground. It also means you can offer a lot of play possibilities in a relatively small area. 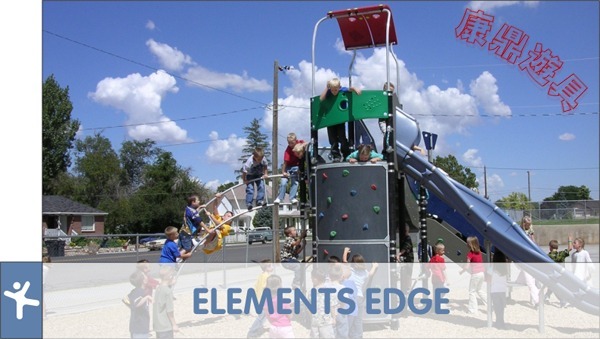 The durable materials used in ELEMENTS EDGE such as stainless and galvanized steel, steel posts with vulcanised rubber, and thick-walled plastics, are low maintenance, and its tough, 'street-wise' look appeals to the age group. Some of the towers and structures are especially designed for urban areas where vandalism may be an issue. Furthermore, it is possible to change certain activities into more vandal-resistant materials.